Are you ready to freeze?! It’s time for Atlantic General Hospital’s annual Penguin Swim! OCEAN CITY, Md–Brrrrr! Are you ready to jump into some icy cold water? It’s the chilliest time of the year and that mean’s it’s time for Atlantic General Hospital’s annual Penguin Swim! 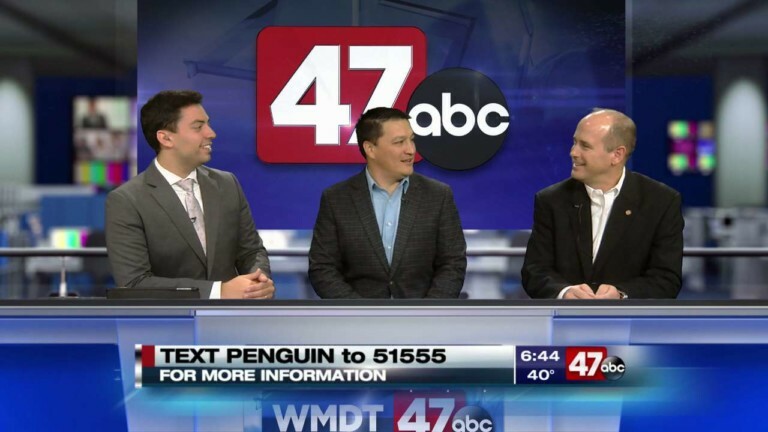 47 ABC’s Brandon Bossert was joined by Michael Cylc and Phillip Cheung on Good Morning Delmarva who are co-chairs for the event. The Penguin Swim supports the non-profit community hospital and people can fund raise with a team or individually. The event will take place January 1st, 2019 at the Princess Royale Oceanfront Hotel in Ocean City. There will also be a costume contest during the event. The registration fee is $25.00 per swimmer. You can register either online or in-person and just by signing up, you can receive a 2019 Penguin Swim t-shirt. For more information you cant text PENGUIN to 51555 or aghpenguinswim.org. Participants are also encouraged to use the hashtag #OCPenguinSwim on social media!